The American Collegiate Hockey Association (ACHA), a member of USA Hockey and an organization of over 430 college and university affiliated hockey programs, will make history when all five of their divisions, Men’s Divisions 1, 2 and 3 and Women’s Divisions 1 and 2, will host their national championships together in Columbus in 2017 and 2018, it was announced at the ACHA Convention in Naples, FL. The ACHA national championships, featuring more than 80 teams and 1,600 players competing in over 100 games, will be hosted March 9-19, 2017 in Columbus at the OhioHealth Chiller Ice Rinks (Dublin, Easton, North) and the OhioHealth Ice Haus at Nationwide Arena. The event is expected to generate an estimated 3,000 hotel room nights. Dates for 2018 are yet to be scheduled. 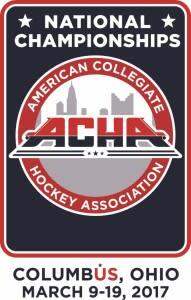 Now celebrating its 26th season of existence, the American Collegiate Hockey Association (ACHA) is an organization of over 475 college and university affiliated hockey programs, which provides structure, regulates operations and promotes the quality of collegiate ice hockey. The ACHA’s primary mission is to support the growth and development of collegiate hockey programs nationwide. The ACHA identifies standards which serve to unite and regulate teams at the collegiate level. For more information on ACHA, visit www.achahockey.org.